Last Monday, on October 10th, Mama G's Italian Restaurant reopened their doors to the public. To say that it has been a long and winding road filled with tragedy would be an understatement, but the family has ultimately triumphed with resounding success. Owned by Paul Gaglio and his mother Krystyna, Mama G's has been a community favorite since its opening in 1999, where they resided until 2005. They then settled into their 777 Highway 441 South location. However, almost exactly one year ago, Mama G's caught fire and settled to ash. In a Facebook post Mama G's said, "51 weeks ago on a chilly Monday morning, the picture on the top (right) was the scene at Mama G's. Today, a more pleasant and beautiful Monday morning, like a phoenix risen from the ashes, we take flight again. We are so happy and excited to see and serve you all once again." 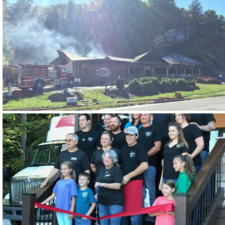 After their previous location burned down, the family has been so strong and the community so faithful and caring that they were able to rebuild, and are better than ever. The restaurant is beautiful and was designed by owner Paul Gaglio. The inside is lovely with plenty of dining space, a full bar and community room for parties. The deck is expansive, offering diners a robust view of the mountains and wraps around one side of the restaurant. Since its opening last week, Mama G's has been full every night. After their opening-day lunch shift, Mama G's shared a Facebook post stating, "Due to an awesome lunch we are having to regroup and prep for a fantastic opening night. From 3-5 we will close to ensure just that! We apologize and hope to see everyone later!" It seems that this isn't something that will slow down anytime soon, Mama G's is a local favorite for authentic Italian food. For more information about the restaurant, visit their website or their Facebook page, or feel free to give them a call at (706) 782-9565.